What is it with “open shelving” that makes it so popular? Why do we want to display our dishes out in the open just to collect dust? Was it the show “fixer upper” that started the craze? Either way, I’m hooked! I knew I had to have some DIY FLOATING DINING ROOM SHELVES. 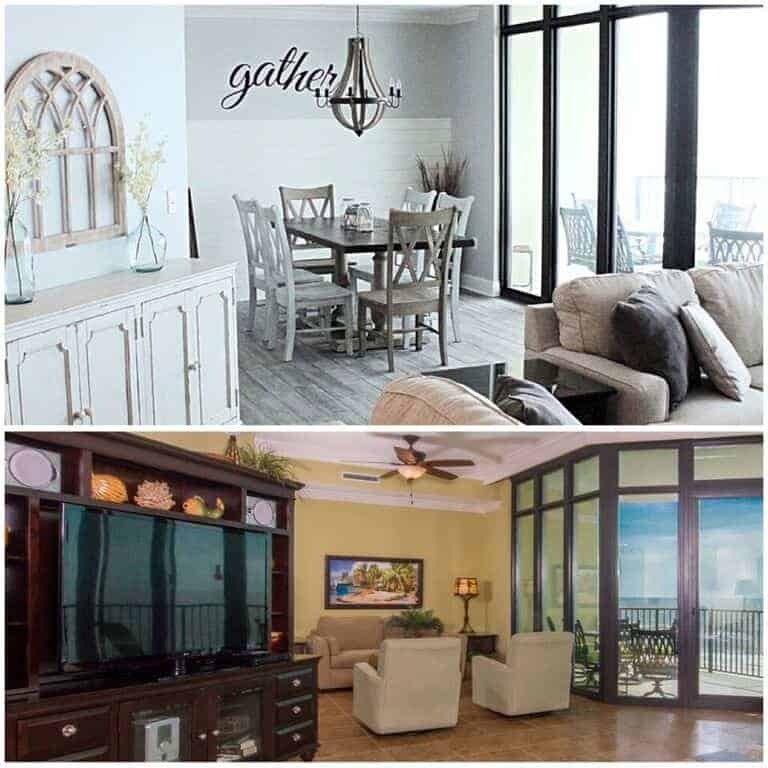 Now the question was HOW would I incorporate open or floating shelving in my house to match the rest of my modern farmhouse decor? 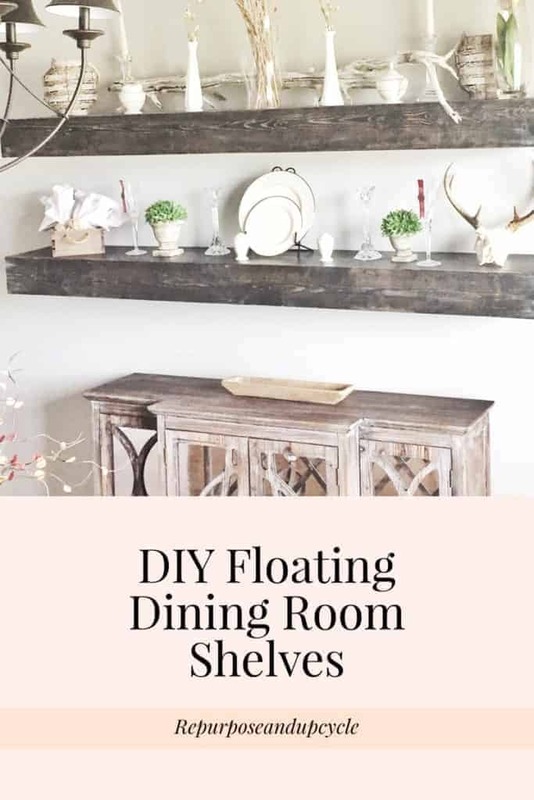 I’ve been wanting to create some DIY FLOATING SHELVES for a long time now, and thanks to Shanty-2-Chic for their great free DIY plans, I decided to build their Floating Dining Room shelving. I made a few modifications, and some of the instructions were a little difficult to follow, so follow with me while I try to explain all my steps. 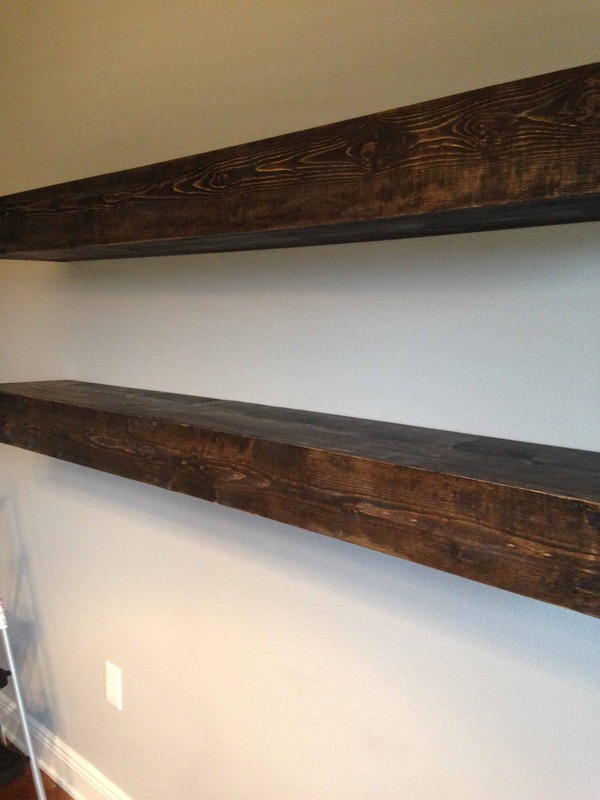 Here is the link for their DIY floating shelves. Like I said earlier, I did do a few things differently. This material list called for a pocket hole jig and pocket screws, neither of which I had. So instead I just bought thick screws and used a drill bit made for “counter sinking” the wood. 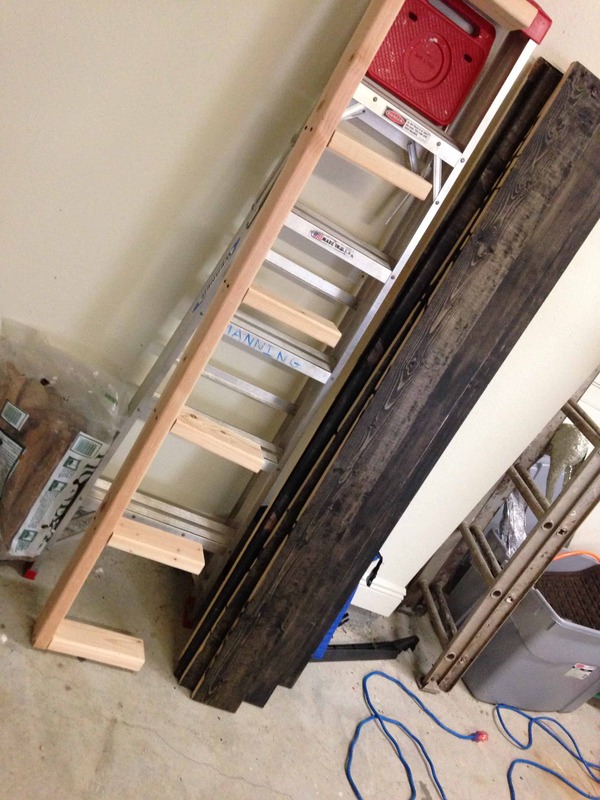 Also, I had Home Depot cut the wood for me (it really wasn’t that many cuts) so all I had to do was assemble. All the materials including screws totaled about $140.00. Build the “Frame” that sits inside the actual shelves: Use a 2 by 4 by 71.5″ and screw quantity 6 of the 2 by 4 by 9 and 3/4″ into it. Space them as equally as you can, but it doesn’t have to be perfect. See the picture below. NOTE: Position the frame on the wall and find the studs before you attach the 6 2 by 4’s. Attach the 2 by 4’s around the studs, even if they aren’t spaced perfectly apart. 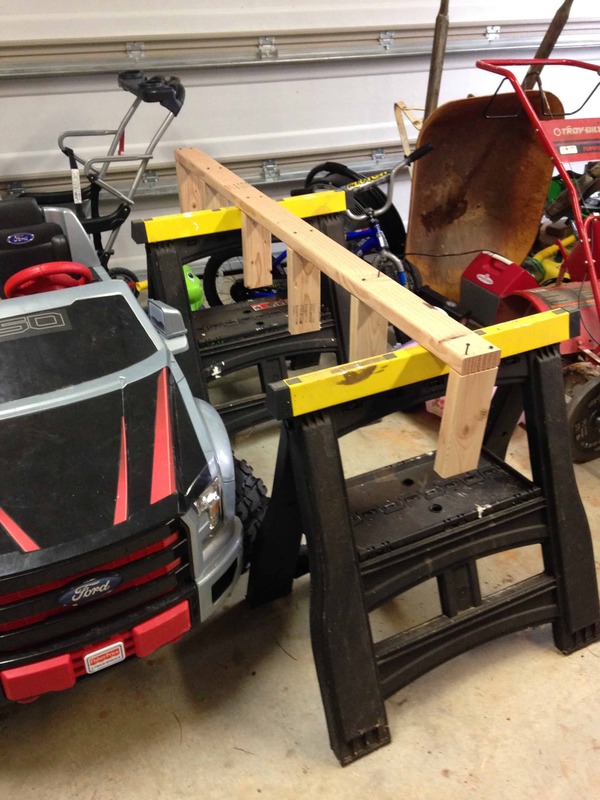 Sorry for all the “extra garage junk,” but this is life, lol. 2. I used 4 large screws (3 -1/2″) to attach this to the wall by drilling into the studs. You could use as many as you want, but since I was drilling into 2 studs, I used 2 screws per stud. Since these shelves are “floating”, you want to make sure nothing (not even an earthquake) will make these open shelves fall. 3. Once you have attached the frame to the wall, stain or paint the wood that will create the “shell” that fits around the base. Note: I attached the base to the wall first before I finished the actual outer shelf part, but you can wait and do it after too. About to stain the pine. 4. Use the counter sinking drill bit to counter sink the 1 by 1/4″ screws into the wood where any two pieces would meet. I started by screwing the side pieces to the top and bottom part of the shelf. 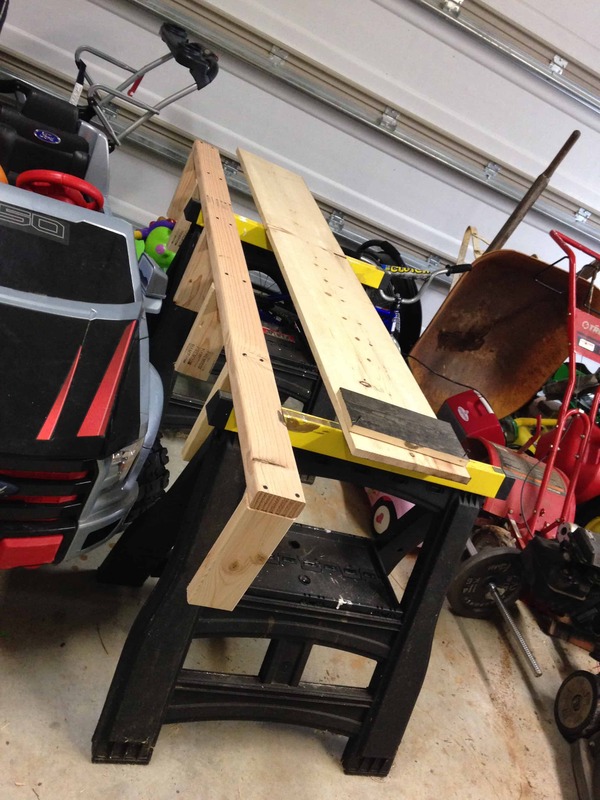 Once the top and bottom pieces of wood were screwed together to the sides, I attached the front part of the shelf. Unfortunately I do not have progress pictures from this step, I don’t know what I was thinking, lol. 5. 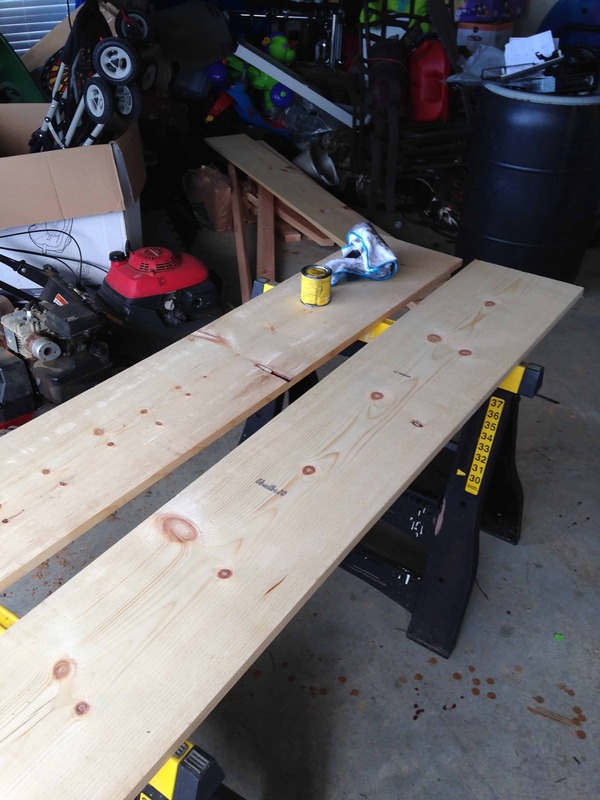 Next, finish the wood by adding a small amount of wood putty on top of all the screws. After the wood putty dries add a little more stain to make it blend. 6. Final step; attach the “outer shell” to the frame. The shell should slide into the frame with a tight snug fit. I chose to use a few finishing nails to nail the outer shell to the frame. Then I covered the nails with putty and stain to make it blend. FYI: You need two sets of hands to assemble these shelves. Here are my DIY FLOATING SHELVES mounted on the wall. Super excited how these shelves turned out! Before, my china was tucked away in a cupboard for no one to see. Not anymore! Isn’t it funny how the new trends (thanks Jojo Gaines) are for all sorts of open and industrial shelving? Speaking of Industrial Open Shelves, you can see a quick tutorial I created for another set of open shelves HERE. To see more home projects like this one click HERE. If you like this post, feel free to pin the image above or you can pin it HERE. What are your thoughts on the new open shelving trend? Do you like them or not? I would love to know your thoughts? I know one thing is for sure, I’ve jumped on this floating shelving trend and my new DIY project is here to stay…for a while at least. Wow thank you so much! I\’m so honored! They turned out beautiful, you did a great job. Thank you for sharing at The Really Crafty Link Party this week. Pinned! Thank you so much Teresa! So glad you enjoyed! These turned out really nice. I am hoping to do some open shelves in my master bathroom so this tutorial is perfect. Thank you for sharing. Pinning. You are super-clever to have made these fantastic floating shelves. I love the ‘old barn board’ look of them. They complement your credenza perfectly, and you’ve done a great job of styling the shelves, too. Thank you! I don’t know if I would call myself clever, but you are kind. Have a great day. We have five adult children and I can only imagine would have happened if we had shelves like this when they were kids. These are really nice and thanks for joining us again at Celebrate Your Story, have a great weekend. Those shelves are so gorgeous. I’m all for open shelving as long as it’s not anywhere near a kitchen, where it will gather grease in addition to dust. Thanks so much for sharing at the #happynowlinkup! These are awesome. What a great look. 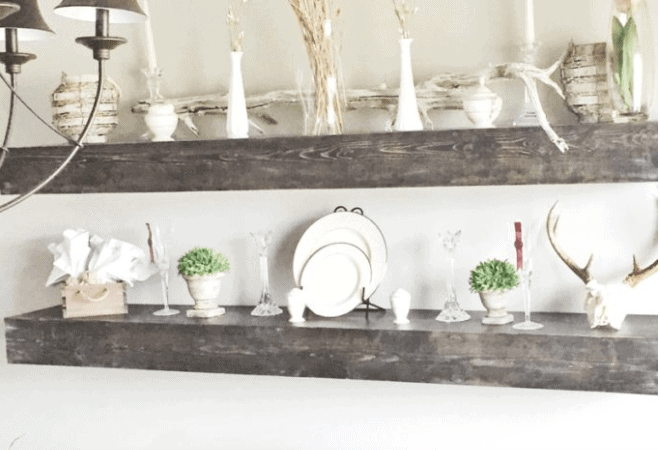 I am featuring your diy floating shelves this Sunday at Dishing It & Digging It Link Party. Thank you for sharing this. Wonderful! Thank you so much for the feature and I’m glad you enjoyed my DIY floating shelves.I hope you have a great weekend. These shelves look awesome. The buffet and shelves go together very well. Good job. They came out great! I like the way you styled them as well! I am redoing my dining room. I have saved this to Pinterest! A super idea! Love the look, these shelves could be used in so many places in my house! Hey Lindsey! I’ve always loved the look of floating shelves. You did such an amazing job, I might just have to give it a try! Thank you so much for sharing with us at Dishing It & Digging It & congratulations on being featured this week! Thank you Angie! I hope you have a wonderful 4th of July! I generally don’t like open shelves in a kitchen, but these are lovely for displaying treasures in your dining room. You did a great job on the instructions, even I can follow along! Thanks for sharing at Celebrate Your Story! I love floating shelves. I love the wood you picked and how they look. Thanks for sharing at the #InspirationSpotlight party @DearCreatives Pinned & sharing. Have a happy 4th of July. I actually purchased that table looking like that and it has a manufactured finish on it. You could recreate that finish with a “white wash” or dry brush technique. Hope this helps! I am loving the superb DIY building tutorial Lindsey! Pinned to my DIY board, Thanks for sharing your project at #FridaysFurnitureFix, we love having you! Thank you Brenda! That means a lot. 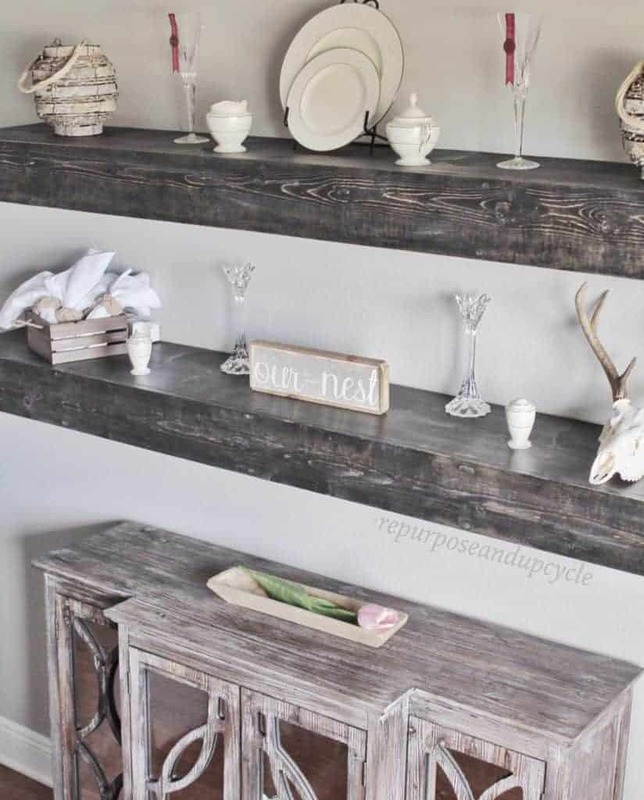 Your floating shelves turned out wonderfully and you have them styled beautifully. 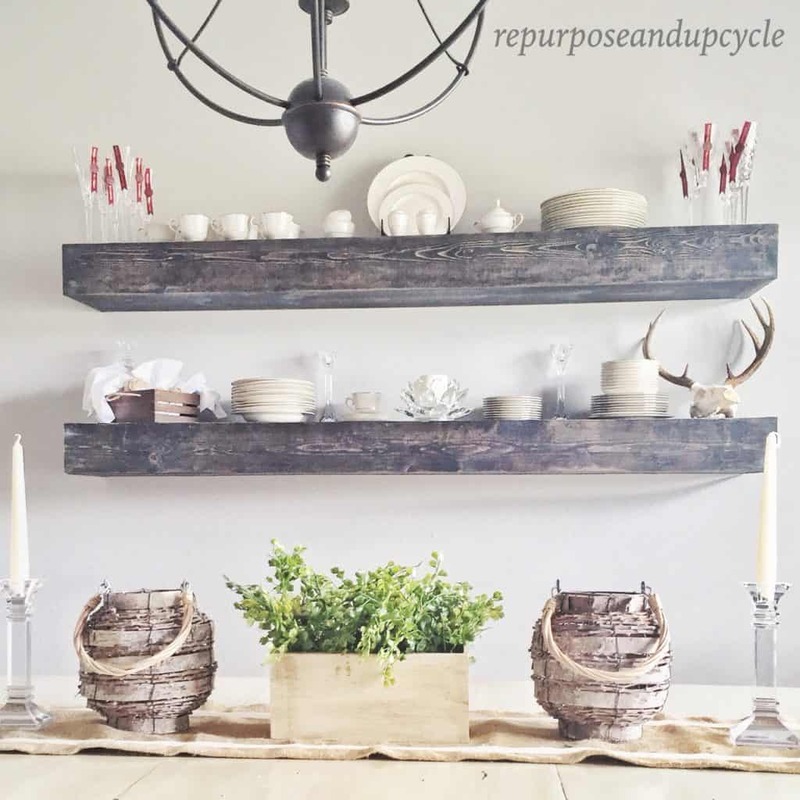 Drop by my blog to see your floating shelves’ post featured at the Snickerdoodle party this week.. Thank you for the feature Sharon! I hope you Have a wonderful weekend. I love the look of floating shelves and yours look great, Lindsey! Thanks for sharing at Snickerdoodle. We’ll be featuring this at today’s party. I really love the color of these shelves! What stains did you use to achieve that grey look? it’s actually stained a brown color (minwax dark walnut). I added just a little white with a dry brush technique to give it a little character. Hope this helps! Pingback: Something Old or Something New? Pingback: Wine'd Down Wednesday 197 | Dizzy Busy and Hungry!